They wanted to design a customized IKEA kitchen with a non-customizable product. We love helping our customers with very unique IKEA kitchen design ideas. 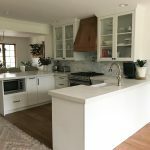 IKD customer Beena from Lake Zurich, IL tells us about her IKD/IKEA experience and how it was to design a customized IKEA kitchen. Why did you select IKEA’s cabinets? It was their prices. We couldn’t afford the prices we were quoted by other cabinet companies. Also, we lived in Europe for a few years and their IKEA kitchens have a good reputation. Why did you select IKD’s design service? I found an installer for the kitchen and he recommended that I design with IKD. I already had my IKEA kitchen design drawn upon their tool (terrible tool), but he explained that IKD can help with proofing the design, create a shopping list that will help them when purchasing the kitchen and diagrams that are easy for them to follow. They were able to design a customized kitchen for me. Did you hire an independent cabinet installer? If so, how was the experience? Yes. Assembly Squad was outstanding. They were helpful and nice from the first conversation. I had plenty of ideas throughout the design process on how to design a customized kitchen from IKEA. They were patient and available to brainstorm and happy to provide insight from their experience. What were the obstacles to designing and installing your kitchen? Design-wise, it was to design a customized IKEA kitchen with a non-customizable product. The biggest challenge was to find a way to get the small appliances in the cabinets, yet useable without having to carry/move them. 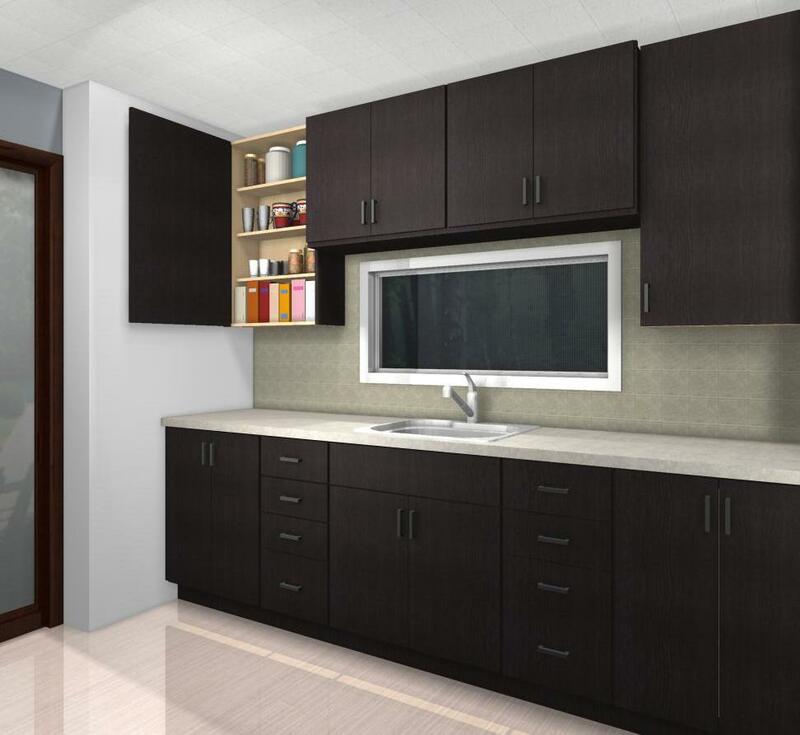 At first, I thought of a cart-on-wheels that will sit inside the cabinets but thought it was too much of a patchy solution for a new kitchen. Then I thought of Tambour doors (saw in an IKD site, a kitchen that used it), but these turned out to be very expensive (I needed 2) and I heard that they tend to break easily. Eventually, I thought of slide out shelves. I bought an IKEA butcher’s block countertop and the assemblers cut it to use as the internal shelves, with 2 heavy-duty telescopic slide outs. We bought door hinges that open 175 degrees so that the shelf could slide out the whole way. Also. it’s a large kitchen. We wanted a unified, straight-line overall look on one hand, but not too boxy and repetitive on the other. For example, to break out the 3×3 drawers on the left side of the kitchen (that are all the same width) I added six narrow drawers, that breaks up the unified look and also is very useful for storing my kitchen gadgets. The installation challenges were mostly that the floor, walls, and ceiling weren’t leveled. The installers did a great job leveling the cabinets. What were your principal concerns about your kitchen and its design? Designing an IKEA kitchen that will look unique (I added unique handles, countertops and light fixtures). Customized storage. I wanted everything to have a place that’s suitable and easy to reach. Over the oven, I added the IKEA rack holders and they worked perfectly for me. I wanted enough space for all my spices and bottles near the stove top, etc..
Clear countertops. I wanted the electrical appliances, such as my mixer, blender, panini press, toaster etc, to be inside the cabinets. Yet functional and available, so I don’t need to carry them from a cabinet to the countertop. Were you influenced by HOUZZ or any design websites? What were your top 3 design wishes? Straight lines, clean look, white and stainless steel. But with a splash of color (chose Burgundy) to connect with the wooden dining table and sofa (added wooden shelves in the kitchen for warmth and to bring in the wood in the dining and living room). Open and airy. No tall cabinets where there are windows and no appliances on the countertops. Customized to my needs. Storage, maneuvering space for a family of six that spends lots of time in the kitchen. I spent a few weeks observing how we were using our previous kitchen; to learn what works and doesn’t work for us. For example, I figured out that we needed 60 inches at the entrance to the kitchen and between the cabinets and the island because it suites the way we work as a family in the kitchen. So if one family member has the dishwasher open, it’s still possible to work on the island without any problem. What was your budget for your kitchen project? I can’t isolate categories since we did some additional work. The kitchen cabinets cost $7,000 because we bought them during the kitchen sale. We saved 20%. What countertop material did you use? Where did you buy it? I took a design risk that paid off: combined two countertops. The island is Quartzite (found a picture of HOUZZ and immediately knew I had to have it), and the other countertop is Caesarstone. 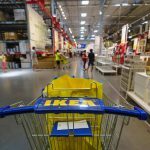 Your words of advice to future IKEA remodelers? It’s possible to get and design a customized IKEA kitchen. Observe your kitchen habits and design your kitchen to suit your needs. Once you know what you want/need, find a way to get your IKEA kitchen to work for you. It doesn’t matter if you only use it to store and display your wine & spirits collection. An IKEA home bar can add lots of style and functionality to your kitchen. With a few tweaks and a clever use of IKEA panels, we designed a home bar that looks like a custom unit. The budget for this project was $1,541 and it was designed with ADEL off-white doors. This IKEA home bar is slim and it can fit in narrow spaces. Customizing IKEA cabinets the perfect solution for those appliances that need a unit that’s one of its kind. If you happen to have a 36″ apron front or farm sink or a gas cooktop of a 36″ width that’s not from IKEA, then a custom AKURUM base cabinet ($252.98) is the right solution. 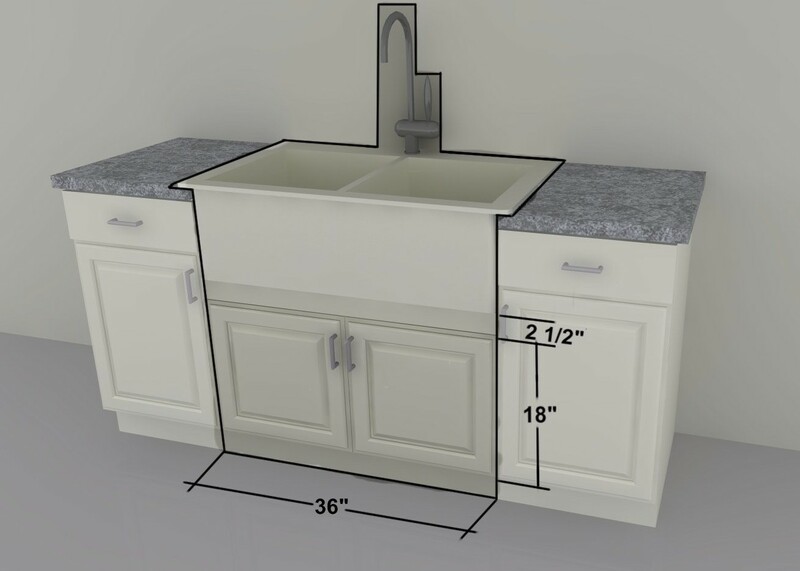 These are the measurements we recommend for an AKURUM custom apron front sink cabinet. You can design a bar area with IKEA cabinets for your home. If you like to have your friends around and have some extra space, then a bar area designed with IKEA’s kitchen cabinets really do start the party. Who would have thought you could create a nice home bar with IKEA? Whether you’re a beginner at entertaining or have been hosting parties for years, a home bar is great to have. Our example above shows the basics: space for smaller appliances, open shelving for your liquor bottles and a sink. Set a budget: Ikea cabinets and countertops shouldn’t cost that much, but stocking your bar may cost more than you think. Our example is only $1500! Accessories: Are you planning on a sink? How about an ice-maker or a wine-cooler? Perhaps a mini-fridge? These will be likely decided after you plan a budget. Think of wires and pipes: A decent bar needs electric for the blender, fridge, etc. and water for the sink. Sort these out before designing. Choose the right cabinets. Usually, closed cabinets are reserved for the bigger liquor bottles, the drawers for the small equipment and glass doors to display your glassware. Ikea’s kitchen cabinets work perfectly for this. Add the finishing touches. Once you have your bar set up, you need to make sure it doesn’t look empty. Think about hanging some IKEA posters or wall decorations. The BILD and TRILLING collections have great options. There are plenty of spice storage options with IKEA, such as the Bekvam and Grundtal spice racks. But what if you want to keep your spices out of sight and in a dark area? As they’re supposed to be! 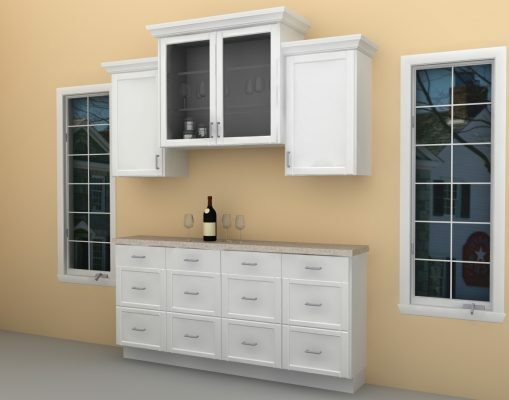 Our solution is not only practical but it looks great at the end of a row of cabinets. The modification is a relatively a simple one. Akurum cabinets have a depth of 12″ 7/8, so trim the back of the cabinet to a total depth of 8″. Keep in mind that less than 6″ isn’t very practical since some spice jars are wider. More shelves should be added since the standard height for spice bottles is between 4″ and 5″. A 30″ wall cabinet can easily fit 4 shelves while a 39″ cabinet fits up to 5 shelves. If spices aren’t a concern, then these reduced depth cabinets make great key holders and can easily be used in the bathroom as a medicine cabinet.